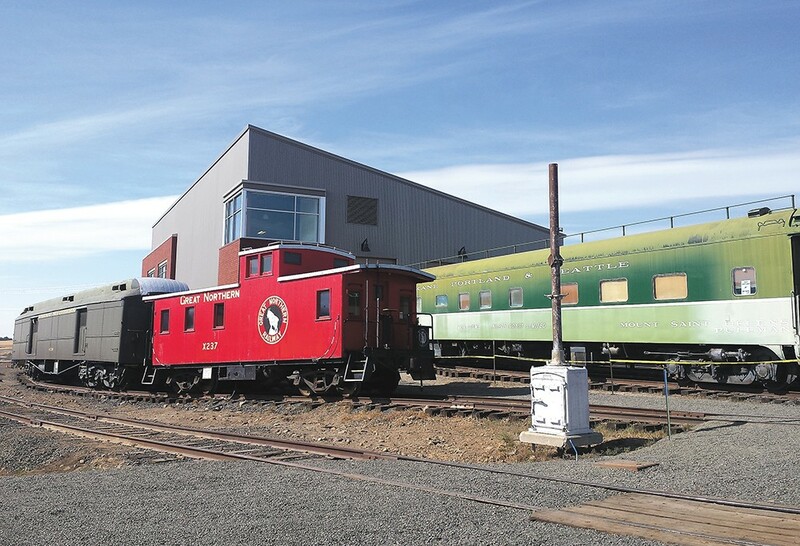 The new museum features trains dating back to the early 1900s. Even if you don't spot the sign where Highway 2 and Highway 231 meet, there's no missing the new Inland Northwest Rail Museum. After driving across miles of rolling brown fields and through tiny Reardan — pro tip: Stop at the HWY Cafe for a slice of the homemade pie — the sight of an impressive collection of engines, cabooses and passenger cars spanning decades of railroad history surrounding the new museum building is striking. That's the desired effect for members of the Inland Empire Railway Historical Society, a group of hobbyists and railroad industry veterans that first formed in 1967 and has been working diligently to make the museum a reality since 2002, when the Spokane Interstate Fairgrounds asked them to move their collection of nearly 30 rail cars and assorted memorabilia from its home there. The group bought this 30-acre plot of land soon after, and the 200 or so active members started laying tracks to hold their collection as they fundraised to build a museum for railroad geeks and the people who love them. The museum opened Aug. 27 and the response was overwhelming, as nearly 2,000 people descended on this rural outpost to check out displays like Spokane's last streetcar, still labeled with its Hillyard, Manito and Gonzaga University destinations, and take rides on the miniature railroad loop that offers some stunning views of the building and surrounding hills. Local police were called in to help deal with the traffic. "I expected 300 to 500 people," says Dale Swant, the museum president. "I bought 300 hot dogs and they were gone in an hour." The parking lot was still being graded the day before the museum opened, and getting the group's trains from Spokane to the museum site took an intense organization of a "hospital train" to carry the antique cars to the rural location, negotiating tag-teams of three different railroads — Union Pacific in Spokane to Burlington Northern in Cheney and finally to the Eastern Washington Gateway Railroad short line that runs by the museum location. Organization seems a strong suit of the group, though, given the impressive display of its collection. And there's plenty more yet to be unpacked and find its way into the showrooms of old signs, restored benches and model trains inside the museum. While it took years of fundraising to reach the point of opening the museum and gift shop, the group has designs on an even bigger structure down the line. For now, though, there is plenty to see for both railroad historians and the merely curious. In the main showroom alongside that Spokane streetcar is a Union Pacific dining car from 1914 that was in service until 1986; the group is restoring it to its original state, with Tiffany glass windows and a lunch counter complete with menus of the era, which travelers used to collect as souvenirs of their trips. Those trips were high-class; filet mignon, asparagus tips au gratin and Great Northern baked ham were just a few of the options. Outside, more rail cars await refurbishing and display, but you can wander through them and peek in the windows now. That's where I find Karen Manly, an older woman traveling from Helena, Montana, to the Okanagan Valley with her husband. They saw the museum from the road and pulled over, and now she's staring at a Vista-Dome passenger car from the old North Coast Limited rail line. "We like trains. We've used them all over the world," Manly says, before peering a little closer to the car. She remembers taking a Vista-Dome back to her childhood hometown of Bozeman from a summer job in Coeur d'Alene when she was a teenager. "The Vista-Dome was really fancy back then." It looks pretty good now in its new home among the fields of Eastern Washington, too.